The Li-Ning Way of Wade 3 is starting to become available in a number of great colorways. 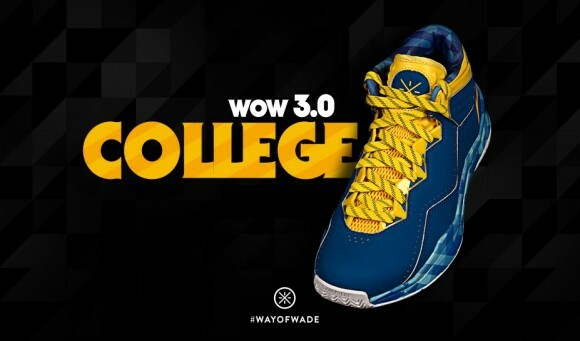 The RazFuego’s recently released which look awesome and the ‘College’ version just landed this morning at WayofWade.com. If you’re a Dubs fan then this is the WoW 3 to get as they’ll go along great with Warriors gear. And I know not everyone was able to get the ‘Playoff’ Curry One so this could be a decent consolation prize. If you were interested in grabbing a pair, they’re available now HERE. These are sick. Hey Nightwing, are you going to do a performance review on the 808 or 808 lows? $35 more than the standard colorways. MVP price increase even though Curry doesn’t wear them. Lame.